Natalia Bernal was a Spanish Immersion teacher at LeConte Elementary in Berkeley, CA for 11 years. She is a native bilingual and her family is from Uruguay. 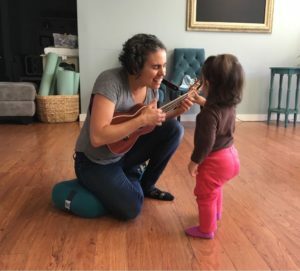 She has a Masters in Education, a Bilingual teaching credential and is trained to teach early childhood music through Music Together and children’s yoga through It’s Yoga Kids. She currently teaches the Healthy Me Music & Movement program and family music programs Canta y Baila Conmigo and Music Together. 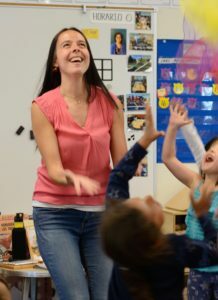 She continues to lead school-wide bilingual singing and dancing assemblies at LeConte Elementary. She has a 7 year-old daughter that inspires her every day. Anna-Maria Violich-Olivier is from Venezuela. She is a credentialed bilingual educator who taught in San Francisco public schools for 12 years. She holds a Masters in Education, a BCLAD, ORFF Certification (music program to teach young children), and is trained to teach Music Together and Canta y Baila Conmigo. She currently teaches music and movement to babies and preschool aged children through Music Together (English curriculum) and Canta y Baila Conmigo (Spanish Curriculum) as well as the Healthy Me Music & Movement Program. She performs with Venezuelan Music Project as a Vocalist and percussionist and is the mother of wonderful twin 4-year-old girls.